Originally published in The Diplomat Magazine, March 29, 2018. Timor Leste's vast, rugged interior: once its saviour, now a foe. DILI — If there’s one piece of advice you can’t escape when traveling in Timor-Leste, it is to get out of the capital and head inland. 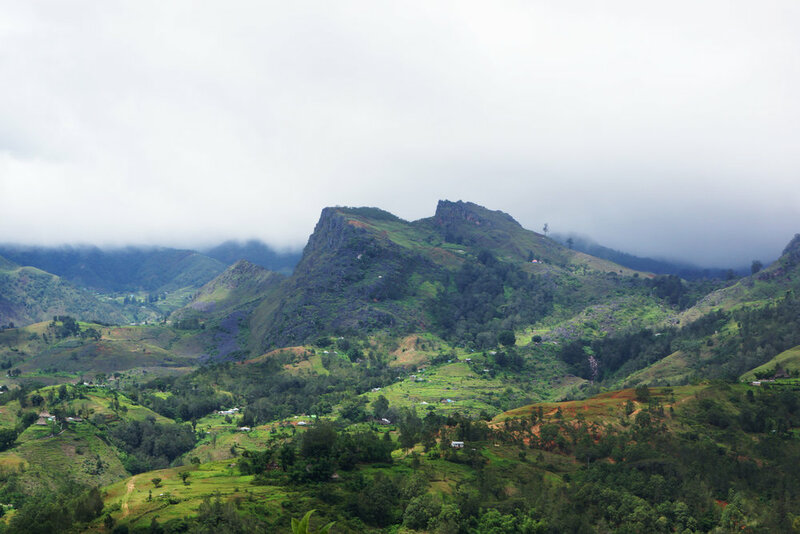 For the East Timorese, the mountains hold a special reverence. While surrounded by bountiful oceans, rich in both contested resources and plentiful fauna, the East Timorese have always looked toward the highlands — towards the safety of their clouded, vast interior — not out to sea. The mountains have long provided sanctuary for the Timorese. During the four centuries of Portuguese rule, the colonists barely explored the hinterland. One local told me that during their rule, the Portuguese only managed to build several kilometers of roads. As the Portuguese held firm on the coast, Timorese looked down from the hills above, often detached from their distant occupiers. Once Portugal decolonized, the Indonesians invaded, and the mountains again provided safe haven. In addition to the tenacity of the East Timorese, the 24-year long resistance survived largely because of the challenges imposed by the terrain Suharto’s men were trying to conquer. The Timorese resisted from their mountain holdouts, with a rich clandestine network of dissidents whispering information through the valleys in a way no occupying force could ever entirely stop. While a third of East Timor’s population wouldn’t survive Indonesia’s occupation, in the end Suharto’s war became unwinnable. But Timor-Leste’s relationship with its geography is complicated. Long an enabler of Timorese independence, the island’s mountains are now a chief adversary in Dili’s quest to link the nation. In the wicker chairs of Hotel Timor’s lobby cafe, my host introduced me to Josh — a seasoned political activist — and two newlyweds, Antonio and his Indonesian wife, Kiki, who’d expatriated themselves to London but were back celebrating their wedding. We talked about history and about the future. For Josh, his childhood was one of chaos and tumult in a mountain community. I asked about life growing up in the mountains during those harrowing years after the Indonesian invasion. Younger and from the capital, Antonio bore witness to some of the pivotal moments in the lead up to East Timor’s independence in 1999. He was on the streets on the day of the 1991 Santa Cruz massacre, when Indonesian militia shot up to 250 Timorese, and remembers the regular violence in Dili through the decade leading up to independence. “I’m heading to Ramelau tomorrow,” I told them, as we finished our coffees. Antonio, a former UN driver with an intimate knowledge of the mountain roads, insisted he take me. 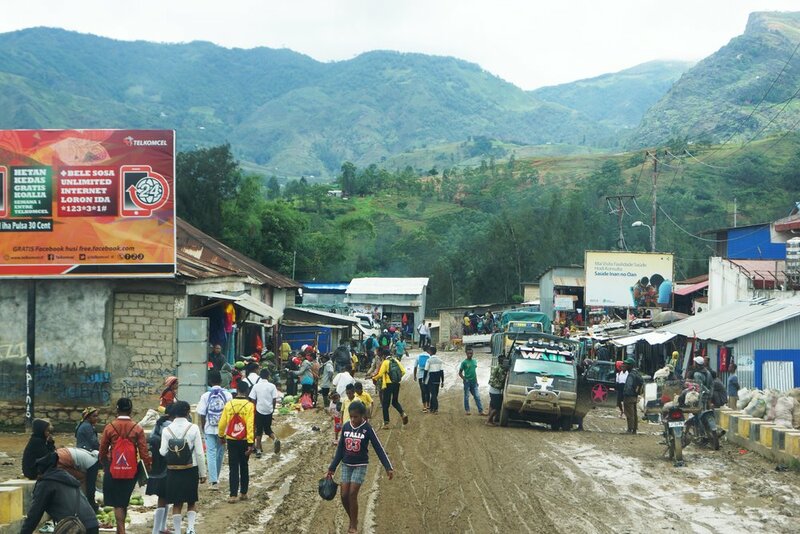 The muddy mainstreet of Maubisse, a hill-town in inland Timor Leste on the road to Ramelau. Just 72 kilometers from Dili, I rationalized that my trip to Ramelau might take the best part of a morning. After a night in Hatu Builico — the closest town to Ramelau’s summit — I’d saunter to the top, take in the much-touted views, and head back to the capital to rest my hiker’s legs as I watched the sun set below the Savu Sea. Antonio and Kiki picked me up early in a beaten up Toyota Land Cruiser, and filled to the brim with what appeared to be Antonio’s entire extended family: four squeezed in the back seat, another six in the tray. Mt. Ramelau is one of the few tourist destinations in a country struggling to build its tourism industry. 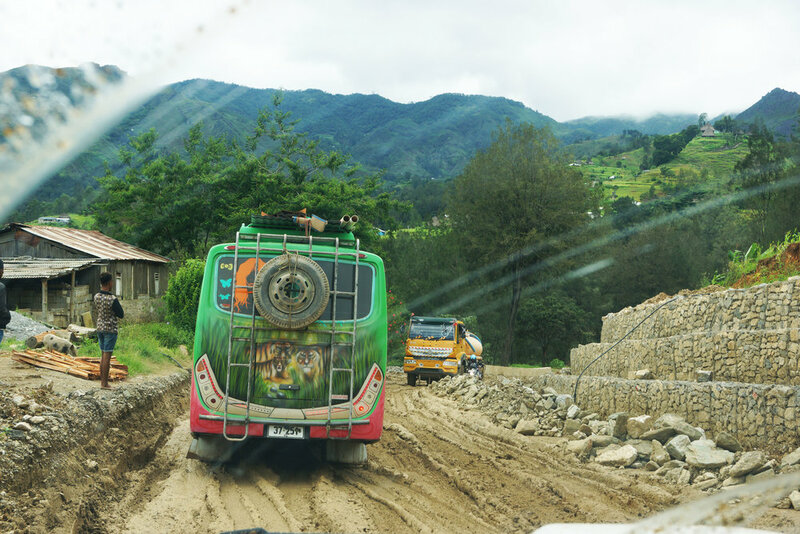 Timor Leste is not only suffering a distinct lack of tourist infrastructure — it often lacks any infrastructure at all. Though roads are being built, the pace of construction is slow. Just getting to Hatu Builico would be a challenge few day-hikes could rival. The first hour of the drive out of Dili was adequate: well-paved, if dangerously driven. But soon the road — one of the major thoroughfares in the country — gives way to near-unpassable stretches of feet-deep potholes and mud. Entire sections of road that have simply collapsed as wet-season storms wreak havoc in the hills. We ambled up the hillside, frequently halted in extensive traffic jams, while drivers exited their vehicles to inspect the obstacles, and strategically plot their path forward. Toward Maubisse, spatterings of beautiful, smooth Chinese-built tarmac tease grateful commuters before the next inevitable bone-rattling section. Just 20 kilometers from Hatu Builico, we were told by locals it would be another four to five hours before Ramelau was in our sights. Soon, the deep mud became all-consuming. Truckers gave up, lining the roads waiting for the afternoon sun to firm up their path just enough to get them moving again. Motorcyclists waded in their flip-flops through the mud, dragging their heavy bikes — wheels clogged with thick earth — along at glacial speeds. Arriving in Hatu Builico, I noted the time. It had been 7 hours since Dili. As I settled in that night in my empty hotel, so did the wet-season storms. I maintained a stubborn confidence that the clouds would break, and I’d have a clear run to some of Southeast Asia’s finest vantage points when I was to start climbing the peak at 3 am. But by then the downpour was only heavier. Little had changed by sunrise. 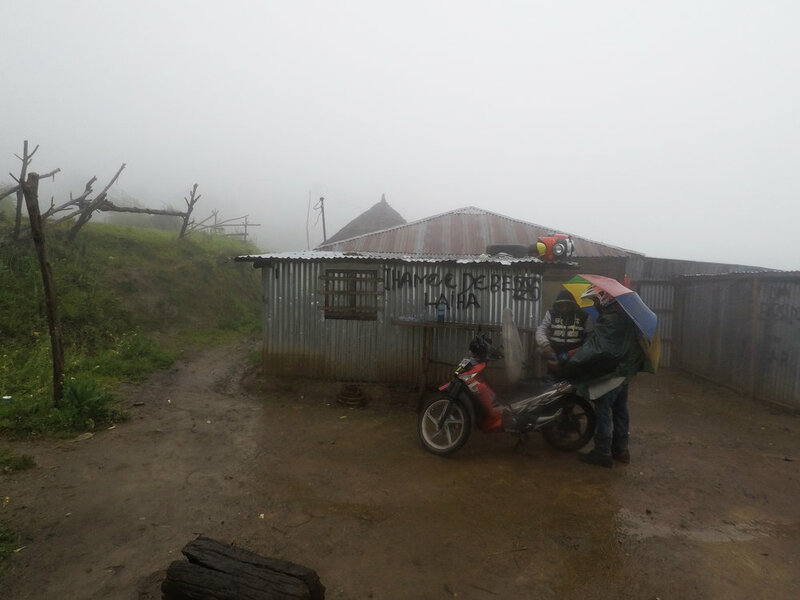 And instead of climbing to Timor’s highest peak, I was advised to get out of Hatu Builico as quick as I could: the single-lane rocky path linking it to the world was bearing the brunt of the storm, and stretches would soon become impassable. With Antonio back in Dili already, I hitched a ride on the back of a local’s motorbike. Over two treacherous hours, riding through driving rain, past fallen trees and in ten meter visibility, my rider carefully plotted our path back toward calmer weather. I’d managed to get down from the mountain. But I was struck: here, in a country desperate for tourists, its major attraction is all but inaccessible. For me, this arduous trip to the mountains had been exhilarating joy ride. But for the locals, it is a brutal burden. For a country desperate to improve its economic standing, the lack of infrastructure and accessibility is a debilitating handbrake on progress. My rider battling the heavy downpour on the way back to town. Could a Gas Windfall Overcome Timor Leste’s Geographic Disadvantages ? Overcoming Timor-Leste’s topographical disadvantages requires enormous investment. Roads are coming, slowly, but their construction is largely funded by aid, and built by Chinese companies often employing Chinese labor. Chinese-branded trucks and equipment, alongside Chinese foremen, were a common sight on the road to Ramelau. Some argue a gas pipeline to the south of the nation could provide the economic boost and high-skilled jobs sorely needed outside of the capital, as well as injecting further capital into the country to allow it to invest further roads and infrastructure. Xanana Gusmao, Timor-Leste’s independence hero and former prime minister, certainly believes so. Leading negotiations with Australia over shared gas resources, he has insisted that the resources in the Greater Sunrise gas reserve be piped to southern Timor-Leste for processing. His hardline stance has been popular in election-season Timor-Leste, with Gusmao returning to a hero’s welcome in Dili in the wake of the negotiations. However, other observers are less certain. Some would prefer to see the economy diversified, and there is some evidence that the value of the gas reserves to Timor-Leste’s south are overhyped. Whatever the outcome, it will take a titanic effort to tame Timor’s unyielding geography. 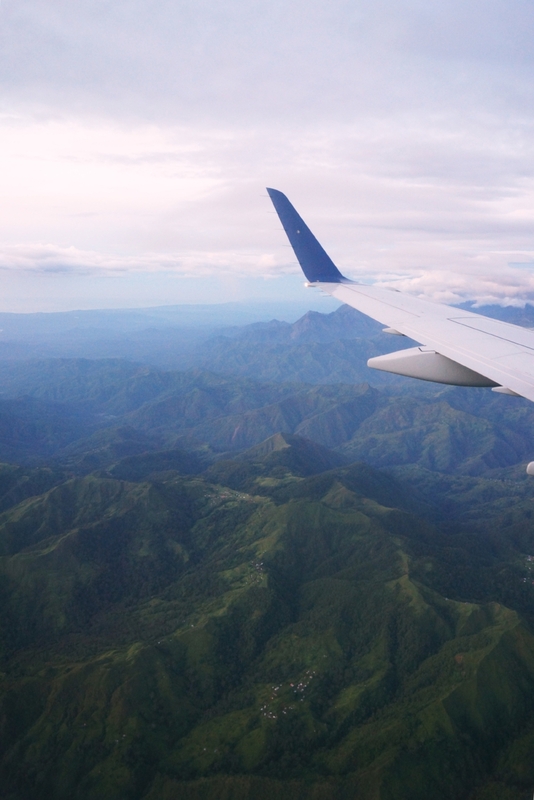 The mountains have defined Timor-Leste’s past. For better or worse, they’ll define its future.